Topics: What Is Geothermal, Horizontal Drilling, Horizontal Pics, Vertical Drilling, Residential, and Commercial. It has 4 nameservers, including ns1.carrierzone.com, ns3.carrierzone.com, and ns2.carrierzone.com. It is hosted by Internetnamesforbusiness.com Florida, using Apache web server. 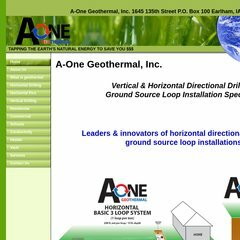 A-onegeothermal.com's server IP number is 64.29.145.9.